Birds, Planes, and Helicopters, Oh My. Helicopters are a very unique human-made flying machine. Unlike airplanes, which use wings and propellers to produce lift and thrust separately, helicopters use a single rotor at the top of the aircraft that produces both thrust and lift. This makes them more analogous to birds, which use twisting of their wings to produce lift and thrust simultaneously. As with all flying machines, a machine that could hover in the air with a propeller on the top was constantly sought after until its initial invention in the 1930s. The ancient Chinese invented a spinning top that would hover if spun. Leonardo da Vinci designed a human-powered machine called the “flying screw” that may have worked if the contraption had been lighter. A Russian and a Frenchman made further advancements in the 18th century. Igor Sikorsky, however, was a pioneer in the field of helicopters, and after some failed first attempts, invented the first helicopter in the 1930s. At first glance, a helicopter may look as if it is incapable of lifting itself off the ground. However, the rotors on a helicopter work similarly to the way the propeller on an airplane produces forward thrust, and there is a main rotor on top of the helicopter to produce lift and a tail rotor to change direction. 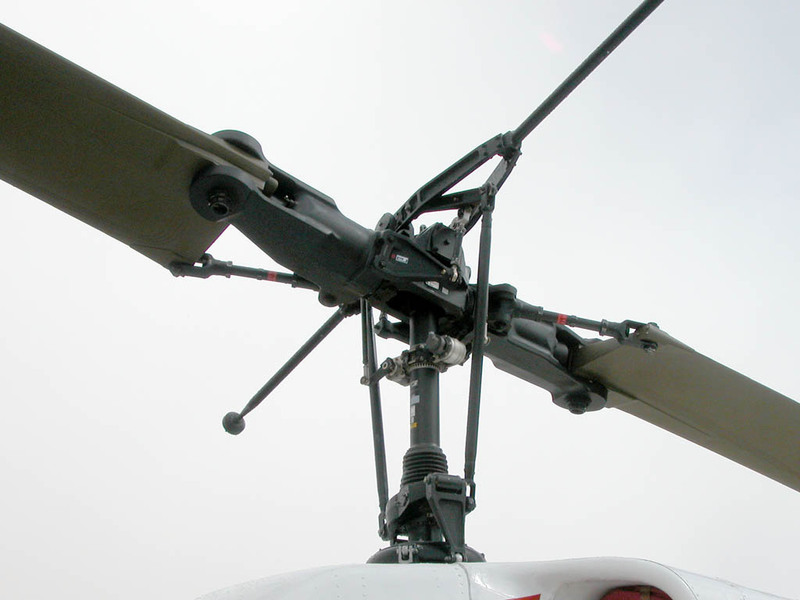 As the rotor on the top of the helicopter spins, air passes over the blades and produces a relative wind component. As the stream of air reaches the trailing edge of the blade, it is forced downward, producing an upward force. This upward force is “lift” and this is what lifts the helicopter into the air. A teetering rotor system tilts the rotor to change the direction of the helicopter. If the pilot wants the helicopter to hover, he keeps the rotor horizontal. However, to move side-to-side, forward, or backward, the rotor must tilt. If the force vector were drawn on the rotor, the angle of the lift vector would tilt slightly depending on which direction the rotor was tilted. This produces a horizontal component of the lift vector. This horizontal force component becomes the thrust that moves the helicopter forward. As mentioned earlier, the concept of one mechanism producing both lift and thrust, as the rotor does on a helicopter, is also one that is mirrored in birds. Birds change the tilt of their wings between their downstroke and upstroke so that they achieve maximum lift and thrust on the downstroke and the upstroke becomes simply a “rebound” stroke. This complicated twisting stroke that birds use has so far been very difficult to implement in man-made inventions, but the concept of using one mechanism to produce both thrust and lift has been an important one nonetheless. 2) the aerodynamic lift around an airfoil —a cross section of a wing or blade—. The second one does not need to point upwards! In fact, it often does not. It is perpendicular to the relative airflow on that airfoil section. It would have been nice to focus this post closer to the course topic, by contrasting the helicopter with a flapping animal.